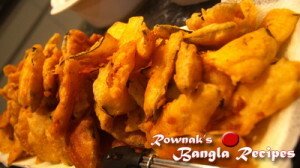 Beguni is basically deep fried sliced egg plant covered with gram flour batter. Begun is very popular in Ramadan. I can remember that egg plant becomes very expensive in Bangladesh at Ramadan time. But high price of egg plant could not resist people to buy it egg plant. So you can understand how popular Beguni is. It is the most common snacks in my house. Because I have made it thousand times, I do lots of experiments with it and find simplest way to make its batter without compromising the taste. Though in our country and traditionally it is used gram flour for beguni batter, I will prefer to use plain flour. I am using carom seeds in it, please make sure you use too. Thanks. 1. Cut egg plant into thin sliced and wash it. Place it in strain and keep aside. 2. Mix all dry ingredients (flour, chilli powder, baking powder and 1 teaspoon salt) together and add 1 and ¾ cup water. Make smooth batter. 3. Rub carom seeds between your palms and add into batter. 4. Heat pan with oil on medium high and when oil is ready, dip sliced egg plant in batter and fry it till it becomes golden brown. Tips: 1. You can use same batter for fuluri, alur chop, kumara and other fries. 2. Water can be need more or less. If your batter is watery add more flour. 3. To the check salt fry little batter first. 4. If you are making fuluri, please boil cauliflower 1-2 minutes.